Mindfulness is almost a trendy catch phrase these days, but learn why it's here to stay. Discover how to tailor a mindfulness program to your school demographic regardless of level, budget or environment. Download accompanying handouts. 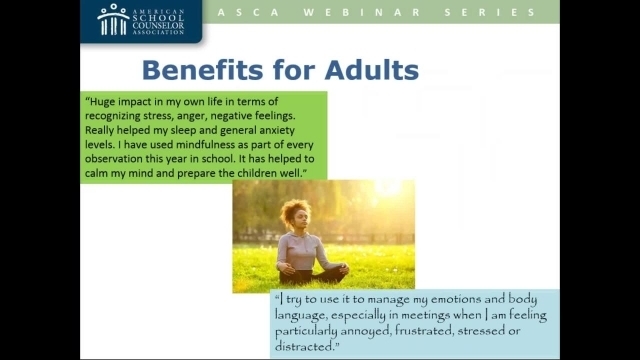 Discuss mindfulness meditation and its benefits for children, adolescents and adults. Link mindfulness practices to student and teacher well-being initiatives. Advocate for the adoption of mindfulness practices in and outside of the classroom. Katrice Grant is a school counselor at GEMS Wellington Academy-Silicon Oasis, a primary school in Dubai, United Arab Emirates. Previously, she worked for 2 years in Fairfax County, VA as a college readiness counselor with Northern Virginia Community College’s Pathway Program. Katrice has been trained by Mindful Schools to teach mindfulness to students in K-12.